Defensive lineman Chris Ford pushes for the tackle against the running back. Ford is one of three former Bulls to be invited to NFL mini camps in the passing weeks. Three former Bulls were recently invited to an NFL minicamp, while former defensive end Derome Harris signed with the Tampa Bay Buccaneers. Former Bulls safety Tim Roberts earned an invitation to attend Washington’s rookie camp. Roberts totaled for 126 tackles in his 21 starts as a Bull. The Louisiana native ranked fifth in the nation for tackles last season. Roberts will report to camp on May 10. Offensive lineman David Goldspy was invited to workout with both the Buffalo Bills and the Oakland Raiders. Goldspy was a core member of the Bulls' offensive line in his two seasons with the team. He is the only Bull to receive a separate team minicamp this off-season. Goldspy is set to attend both camps in early May. Nose Tackle Chris Ford recently reported to a minicamp with the Baltimore Ravens on May 4. In Ford’s 42 career games with the Bulls, he had 89 tackles and was a senior leader on the offensive line this past season. Nothing has been announced on any future plans for Ford. Harris signed with the Tampa Bay Buccaneers in the free agency on April 28 after coming off a career season. Harris was an All-MAC selection as he led the Bulls in both sacks and tackles last season. Harris started at UB as a walk-on and went on to play in 43 games and record 107 tackles. Harris is the only one of the four to be officially part of an NFL team heading into spring training. Ford, Harris and Roberts all finished their careers at UB with 80 or more tackles. Khalil Mack, Steven Means, Kristjan Sokoli and most recently Mason Schreck are currently the four active former Bulls playing in the NFL. Mack is most known for being the overall fifth pick in the 2014 NFL Draft and his three Pro-Bowl appearances with the Oakland Raiders. The NFL rookie football development program is set to begin on May 14. 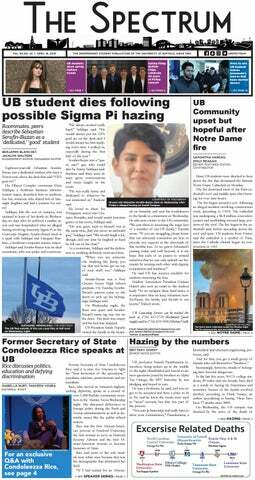 Sports Desk can be reached at sports@ubspectrum.com and @ubspecsports.